Sometimes you stumble onto something that resonates deeply in your heart. The words in this book were like that to my marriage. Yes, this is what I want too. I yearn deeply for sanctification and holiness for my husband and myself. Honestly, much of it brought tears to my eyes. I want to embrace and face the challenges that marriage brings at you. 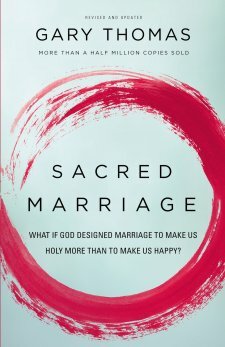 I desire that sacred space you enter into with someone after you have overcome a great obstacle.I want to confront my selfishness and become a life-giving spouse. The real purpose of marriage is not to enjoy infatuation and make me happy. It isn't just some formula to protect us from sexual immorality. It's sacred space. One quote in the book stated that marriage is a merciless revealer. It shows a light into the darkest parts of the human nature. It's true. In that space we can choose to submit to the healing of Christ. This book is a guide on how to do that. "We preserve our marriage because it brings glory to God and points a sinful world to a reconciling creator." Our marriages preach the gospel to a lost and dying world. How fiercely we should protect them. We must become reconcilers ourselves. I WANT TO QUOTE THE WHOLE BOOK TO Y'ALL! Every single page made me want to love my man more, better...to seek Christ to change me into someone who loves more deeply.